Update, Nov. 5, 8:30 a.m.: Video added below. Well, let's see how well this unspeakably pathetic attempt to explain away the lie of the century (so far) works with the establishment press. .. REP. KEVIN McCARTHY, R-Calif.: "When we started this health care debate, the president led with a very big promise to the American people: If you like the health care that you have, that you currently have, you can keep it." - At a Sept. 20 House Republican rally after passage of the bill that would finance the government on condition the health care law is starved of money. You don't get to change your evaluation now, Cal. Or the rest of you at AP. Or Bill Maher. Or progressive cable clowns. Or prog pundits. 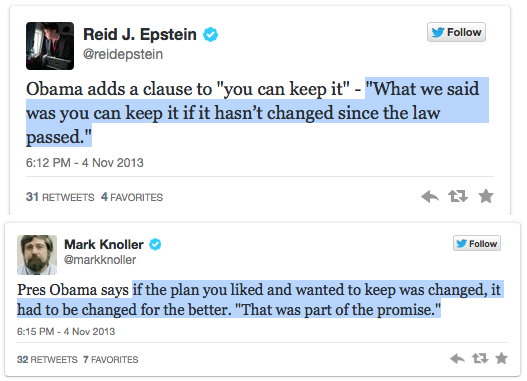 Or anyone else who correctly recognized Obama's serial statement as the lie that it was. Actually, any insurance that you currently have would be grandfathered in so you could keep it. So you could decide not to get in the exchange the better plan. I could keep my Acme Insurance, just a high deductible catastrophic plan. I would not be required to get the better one. So even the new lie doesn't fly.